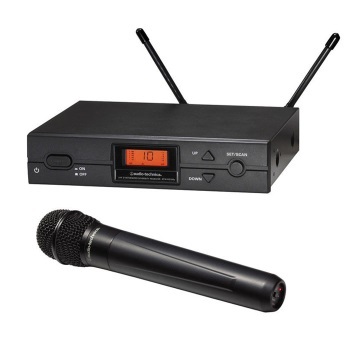 The Audio Technica 2000 series wireless handheld dynamic wireless handheld microphone system is a UHF wireless microphone system that delivers professional wireless performance. Straightforward setup, automatic scanning, and other advanced wireless features brings its performance to a standard that provides the audio quality and reliability necessary for the quality sound systems of today. The ATW-T220a handheld transmitter uses a PRO 41-type dynamic unidirectional capsule to maintain sonic consistency with wired counterparts. Adjustable trim control helps match the microphone to the audio source and an ergonomically designed handle and end-mounted recessed controls help maintain a clean uncluttered appearance. A rugged steel head case protects the capsule while providing relief from wind-induced noise.